Learn about the environmental justice resources EPA offers to help communities ensure the fair treatment and meaningful involvement of all people regardless of race, color, national origin, or income, with respect to the development, implementation, and enforcement of environmental laws, regulations, and policies. Find resources and tools to help communities put previously contaminated properties back into productive use on the Land Revitalization website. Read about how EPA worked with local leaders to help them realize their community's vision for the future in the "Community Stories" story map (link opens in new window or tab). 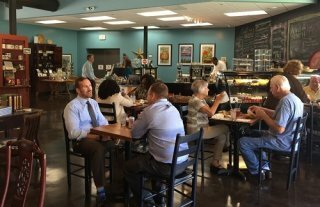 Walterboro, South Carolina, spurred downtown revitalization by supporting a commercial kitchen to help local food entrepreneurs. Resources from across EPA to help communities protect the environment, improve health, and strengthen their economies. Apply for Recreation Economy for Rural Communities planning assistance to revitalize Main Streets through outdoor recreation. Deadline May 31, 2019. The FY20 Environmental Workforce Development and Job Training Request for Proposals has been posted. Deadline June 10, 2019. A webinar for those interested in applying for the grant will be held on May 1, 2019, at 2:00 pm ET. The 2019 National Brownfields Training Conference will be held on Dec. 11-13, 2019.